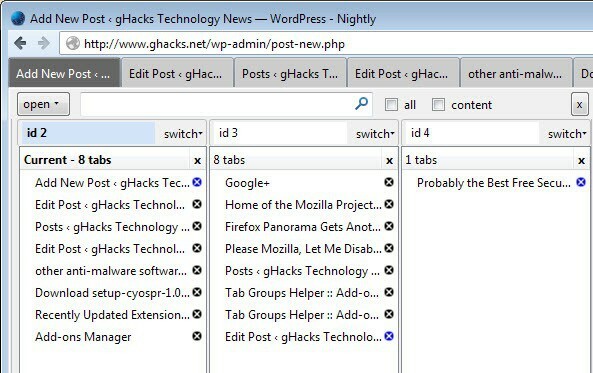 Firefox's tab grouping feature Panorama was designed by Mozilla to improve the tab handling in the browser. It had a bad start, went through several hotkey changes, and seems to have been put on ice by Mozilla for quite some time now. Last thing I heard was that Mozilla was thinking about removing it from Firefox, and offering it as an add-on instead, something that the organization should have done in first place in my opinion. I never liked the feature, and the core reason why is that it uses a second page to manage and interact with tabs and groups. So, if you want to switch or manage tabs or groups, you either press the hotkey, it is Ctrl-Shift-E now by the way, or click on the Tab Groups button somewhere in the Firefox interface. The page that opens up displays a list of thumbnails and groups, and you can use drag and drop to move things around, create new groups or name them. So, if you want to switch to another tab group, you hit Ctrl-Shift-E, select the group on the page that opens up, and are taken back to the regular Firefox interface. The new Firefox extension Tab Groups Helper changes that, and in my opinion, for the better. Instead of using two different interfaces, it displays the tab groups on the frontend right away. Even better is the fact that it displays open tabs as text only, so that a lot of tabs and groups can be displayed directly in Firefox. There are two ways to invoke the menu currently. You can either right-click on a tab and select the new Tab Groups Helper item there, or display a toolbar button instead for that. The display all tab groups option is displayed on the screenshot above. As you can see, all tab groups and all tabs that are filed under them are displayed directly in the Firefox interface. You can use drag and drop to move tabs around elegantly on the screen, create a new group easily as well,close or open tabs, or rename existing groups. Besides that, it is also possible to search across all open tabs or only the tabs of the active group, with search results being displayed -- you guessed it right -- in the same interface next to all tabs. The right-click context menu displays all groups and tabs, and you can switch to any elegantly here as well. Tab Groups Helper does not interfere with Panorama in any way. Mozilla's own implementation is still available, and you can use both next to each other if you want to do so. 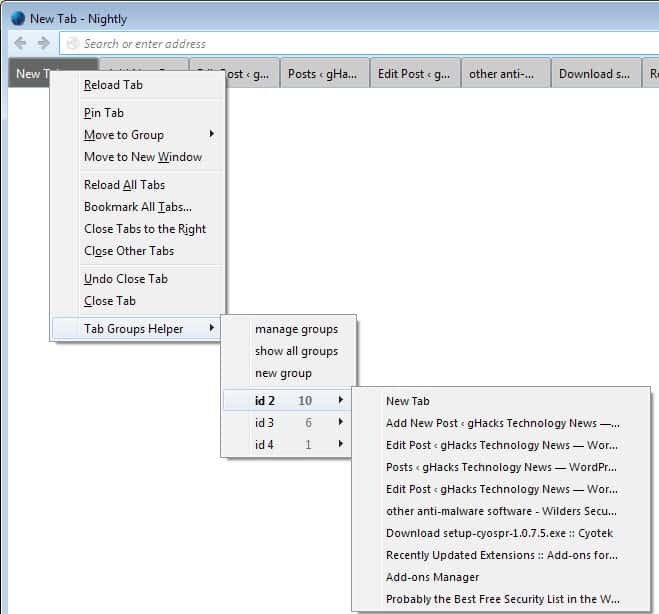 What I like about Tab Groups Helper is that it improves the usability of Firefox's tab grouping feature significantly. You do not have to switch screens anymore to manage tabs and groups, and the representation as text makes more sense than thumbnail images, at least if you happen to have more than ten or so tabs open in the web browser. That said, it is an early version. I'm not quite sure what the difference between manage groups and show all groups is, as both offer the same functionality. Manage groups displays only two groups, while show all groups all of them. Keyboard shortcuts would be handy I guess to display all tab groups, but other than that, this is really working well. TabGroups Manager creates a second tabbar, where each tab is a group. Thanks, Martin — I appreciate your bringing this extension to our attention. I’d been using the TabGroups Menu extension for a while and (unless I’m quite mistaken) it didn’t offer any way to select multiple tabs in one group and move them to a different group in a single operation. Tab Groups Helper does, and it makes retroactively organizing your tabs much faster and simpler. There’s a bit of a learning curve in figuring out how Tab Groups Helper’s interface works — how to bring a different tab group to the foreground in Firefox, for example — but it’s worth it. The one thing I thought I would miss was the Tab Groups menu item with its optional tab count* and group count display (e.g., “Tab Groups (87/4”), but I just put Tab Groups Helper’s toolbar button next to the Help menu, close to where the Tab Groups menu item used to be, and installed and put the “open tab count widget” next to that, and it’s close enough to what I was used to. There are: alt + G to open main interface, alt + 1, alt + 2, etc to switch groups. TGH has been updated with some changes and additions to make things a little more polished. For example, the mostly redundant “Show All Groups” has been removed. It is pending review by Mozilla.